Long fascinated with the rich history and social complexity of India and its evolution away from tradition, seeing Between the Assassinations in my random eBay audiobook lot ignited a spark of enthusiasm. On another long trek across states, the fiancé and I tucked in with bad road food, plenty of snacks, and this promising book touted as the showcase of an aspiring new author. Pastel writing on the shiny plastic sleeve bragging about “Man Booker Prizes” and the rise of a brilliant new literary voice further raised the expectations – while also making me secretly a little nervous that this hodgepodge collection of short stories was going to be more cerebral and vague than visceral. My background with India is relevant only in that most of my coworkers are from India, including different regions both rural and urban. One coworker in particular is from a rural village in India and is open to talking about the changing dynamics of culture and daily life. Strongly felt prejudices between groups are still very much felt, even to the unwary American eye. For instance, resentment exists between Indian residents in the city and those in the country, northern and southern Indians, Indians of lower classes verses their priestly Brahmin high class, and of course, juxtaposing religions (mostly Hindu and Muslim.) All of these social indicators make a marked difference in the daily life of an Indian and while it’s not all pretty, it’s still very real and slow to change. So with these expectations, or should I say raw questions, it was easy to be disappointed. 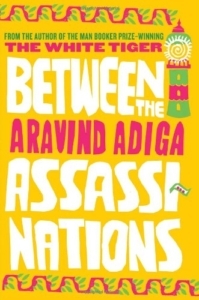 Between the Assassinations is ostensibly a collection of unconnected stories set between the assassinations of Indira Gandhi in 1984 and her son Rajiv in 1991, neither of whom are mentioned or relevant within the stories. It all takes place within a few weeks in a fictitious Indian town and is interspersed with tourist like guidebook quotes. All this isn’t to say that the collection is unworthy, just incomplete feeling. Perhaps it just tackled something too big or perhaps I was wanting answers to questions which, in and of themselves, cannot be defined and neatly slotted into a story with beginning, middle, and end. All of that aside, there’s a lot here. Some stories are more effecting than others and the topics covered typically deal with religion, caste, and the issue of wealth and the lack of a “middle class.” In one especially memorable and lengthy story a man who runs with a cart to perform deliveries everyday oscillates between just surviving and an all consuming rage which is so palpable and elemental that despite the despair in his plodding day, readers are unable to fall into a depressing, lifeless malaise. We want to run by that man and we want to explode with him as he battles not to become a merely reactionary (and obscenely angry) animal. In another story, a disenchanted student sets off a bomb in his class, a statement against the caste system. It’s a topic and a situation that should be serious but instead devolves into a mockery as the teacher, fumbling with a speech impediment, yells at his class “You puckers! You motherpuckers!” In the end, confession itself is a joke as the system accepts neither honesty nor legitimate repentance. There is no room for change, no place for honesty, no marketplace for confusion or regret. All this is denied existence, just as a serious situation becomes a tragic comedy. Perhaps most memorable, in one of the collection’s later tales of a young girl begs for her shiftless father to support his drug habit. Her entrapment in an abusive parental relationship is merely a mirror of the society that surrounds her and showcases the irony of boxed living where everyone exists in their own private hell and together builds bigger and bigger replicas of their particular purgatories. In other stories we meet similarly unique characters: a married couple who despite their happiness are seen as eccentric since they have opted to have no children; a man who works his way from spraying a rich ladies garden into becoming her invaluable servant and through one moment of forgetfulness losses everything; a man sent away from his family and new in town aspires to be the best bus conductor but each night must bribe a gangster for a slot of ground in a back alley to sleep in; a Muslim boy seeks employment but is looked down on by his Hindu compatriots only to conversely judge them just as harshly, and so on. It’s “slice of life” type of writing with the brutal smack of realism and the grittiness of street life. Written half like a guidebook and half like a series of disconnected events strung on an idly flicking necklace, the stories have no cohesive whole and no real direction. They simply are, and in this they flaunt their beauty and also their weaknesses. The issues Adiga concentrates on are the ones we traditionally expect to hear, yet the spectrum isn’t quite wide enough and the emerging role of women is distinctly absent. Indeed, the few female characters are disappointingly one dimensional, dare I even say bitchy, and while the pathos for the male characters shines with emerging individuality and a roughly defined sense of self-worth, other cultural issues are skimmed over or simply not addressed. It’s incomplete and since none of the stories themselves have a central theme (or an ending) the last page feels like a letdown. We’ve read so much – been through so much – but where do we take it and what do we do with all these incidents, some stunning and some mundane? I mean, when the chips are down, what does it all mean, if anything. Is this merely a shadow play of episodes in the life of various people and, if so, why are we always cut off when the story seems to find direction, when an ending or some sort of culmination is promised? 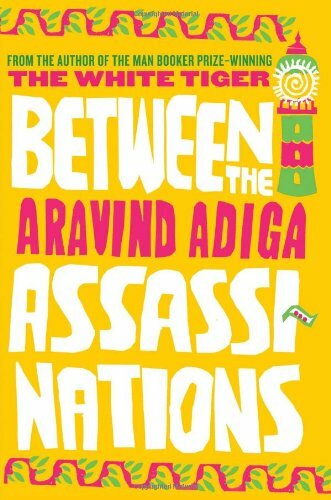 If Between the Assassinations is an opus of “a moment in the life of” dedicated to the emerging citizens of an evolving India, so be it, yet a feeling of closure or of continued action after the last page is needed. Instead, a certain stasis pervades and the final feeling is one of listless acceptance. It’s like there are still a crucial ten pages missing that will tie it all together and say why these people, why at this time, why at these moments, and why we, in particular, are being told. Regardless, incomplete or otherwise, the collection opens up a small spotlight on a big country and in the attempt alone, I applaud it.